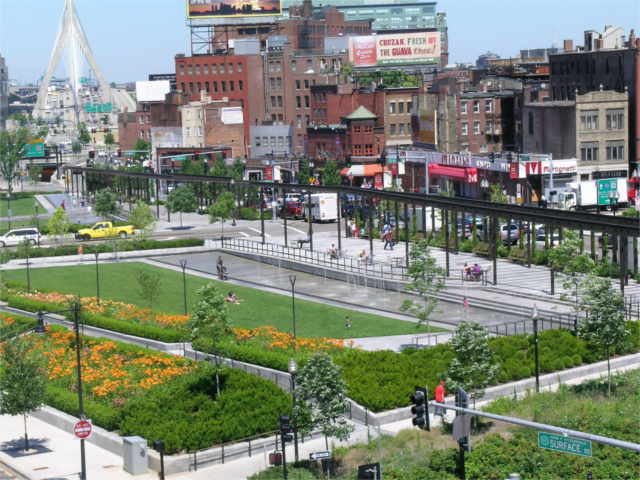 The Greenway urban park in the US city of Boston, MA. By gconservancy. With the theme of Earth Day 2013 being, the Face of Climate Change, TheCityFix discusses how transport can play an integral role in solutions to help mitigate climate change and its deadly effects. For the thousands of residents in the Chicagoland area whose houses are underwater this month because of record rainfalls, climate change has made a startling entrance. But for the millions of people around the globe displaced by unprecedented droughts and record floods; historic snowfalls and killer heat-waves; food shortages; and disease-carrying mosquito swarms, climate change arrived years ago. The extreme consequences of climate change are no longer future events. The classic images of climate change — remote glaciers breaking off into the sea or drowning polar bears in the Arctic Ocean – have changed in recent years. “The far-away effects of climate change at the poles and long-term changes such as rising sea levels weren´t enough to spur world leaders into action to fight climate change or change the pace of their economic growth,” says Jorge Macias, manager of the Economics and Environmental Regulations department at EMBARQ Mexico. Suddenly, “superstorms” in developed nations, like Hurricane Katrina in 2005 (the most expensive natural disaster in the history of the United States, at US$146 billion brought the effects of climate change to the front door of one of the world’s top contributors to climate change. Those who suffered most in that disaster, as it is with similar events around the globe, were the poor. We think of natural disasters as somehow even-handed, as somehow random, yet it has always been thus: poor people are in danger. That is what it means to be poor. It is dangerous to be poor. On a global level, the poorest are hardest hit both because of their geographic location — from the high Andes, where glaciers have shrunk 50 percent since the 1970s, affecting the drinking water and agricultural water supply for millions, to low-lying coastal areas that are slowly but steadily being submerged by rising sea levels, displacing entire communities. The price of climate change is measured not only in human lives, the cost of displacement, and shrinking natural resources such as water, but also through enormous amounts of money required to clean up natural disasters. Climate change doubters can no longer pit economic development against environmental responsibility. They are one in the same. Between 1980 and 1995, there were 46 natural disasters (such as Hurricane Andrew) that cost $1 billion or more in the United States, adding up to a total loss of $339 billion. Between 1996 and 2011, there were 87 natural disasters costing a billion dollars or more, with a total loss of $541 billion. In 2011 alone, the U.S. witnessed a record number of disasters, including seven tornados, three floods, an ice storm, wildfire, drought, and hurricane all costing at least US$1 billion each. The direct economic costs of cleaning up climate-change induced disasters in the United States might be what it takes to wake up decision makers in G20 governments. “The G20 governments must accelerate the phasing-out of fossil-fuel subsidies, enact long-term carbon price signals, enable greater free trade in green technologies, and expand investment in climate adaptation,” says a report for the World Economic Forum. The report shows that about $700 billion per year is needed to promote renewable power, energy efficiency and low-carbon transport. In comparison, worldwide subsidies on fossil-fuels was $409 billion in 2010. Macias added that the transportation sector is the fastest growing sector of greenhouse gas emitters on a worldwide scale, pointing out that we are nearing 2 billion cars on our planet. “There is a need to integrate fleet policy on a global scale, including fuel economy standards, second-hand car trade, increasing public transport, and responsible urban development,” he said. One of the biggest impacts the transportation sector can have in combating climate change is in cutting fossil-fuel subsidies, which would put economic pressure on cities to switch to more fuel-efficient modes of transport and encourage non-motorized transport, as well as pressure individual citizens to invest in more fuel-efficient vehicles, public transport and non-motorized transport. According to the World Resource Institute, in 2010 fossil-fuel subsidies were $409 billion, and without any subsidy reform, they are set to increase to a staggering $660 billion in 2020. And although renewable energy subsidies are growing, they still have a long way to go. In 2010 they were at $66 billion, up from $39 million in 2007. The slow pace and limited impact of nationwide economic reforms, fossil-fuel subsidies, and numerous conferences of global leaders have left many of us underwhelmed by the apparently inadequate advances to battling climate change. In the end, we all have heard about the various small changes that we can each make in our lives to help with the climate change battle: using less energy, eating less meat, taking more public transport, and educating ourselves about climate change and its effects. But above all, we can guide our actions with a simple thought: our present actions can help prevent future disasters. And no matter what issue touches your heart, whether it’s food security, water resources, ocean health, animal rights, indigenous culture preservation, or anything else on this planet, remember that climate change affects us all, no matter where we live. If we protect the most vulnerable by adapting our habits, we protect everyone, including ourselves.